Benoit's Best Salt Free Cajun Seasoning 12 oz. Home » Products » Cajun & Creole Seasoning » Benoit's Best Salt Free Cajun Seasoning 12 oz. 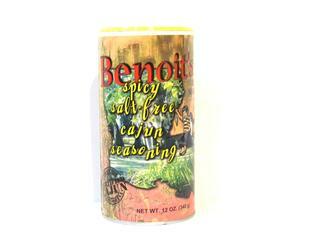 Benoit's Best Spicy Salt-Free Cajun Seasoning is made right here in southern Louisiana. This zesty seasoning is perfect for those with health conditions requiring a limited salt intake. Benoit's Best will bring out the natural flavor in all of your favorite foods. Benoit's Best is used by schools & hospitals in southern Louisiana and is also recommended by doctors. This Salt-Free Cajun Seasoning contains No MSG. No Sodium. No Salt. Period! What a great all-natural no-salt substitute. You'll be amazed at how much natural flavor this seasoning contains! Purchase by the case to save 10%! Ingredients: Garlic, onion, red pepper, black pepper, paprika, parsley, and red bell pepper. This product is packed for Cajun Wholesale Distributing.